Each player chooses a color. Take the farmyard of your color and place it in front of you. Your farmyard is home to your family members. In addition, you may store as many influence cubes and goods here as you want. Each farmyard can only store a maximum of 5 bags of grain, however. The life time track of your family runs around the edge of your farmyard. Take the 11 family members and 8 markers of your chosen color. Put your 4 family members with a "1" on your farmyard. This is the first generation of your family. The remaining family members are future generations. Since these are not born yet, set them aside in a general supply for now. Put one of your markers on the cloud on the right side of the bridge on your farmyard. Put another marker on the book (space "0" of the prestige track) in the upper left corner of the game board. Give each player 1 coin, which he places next to his farmyard. Place the remaining coins in a general supply next to the game board. in a 4-player-game: put a tile on each of the 10 spaces. in a 3-player-game: the space labeled "4" remains empty. in a 2-player-game: the spaces labeled "3" and "4" remain empty Example for a 3-player-game. If you play with fewer than 4 players, use family members of an unclaimed color to reduce the number of available spaces in the chronicle and the anonymous graves. in a 3-player-game: put an unused family member on each space and grave labeled "4". 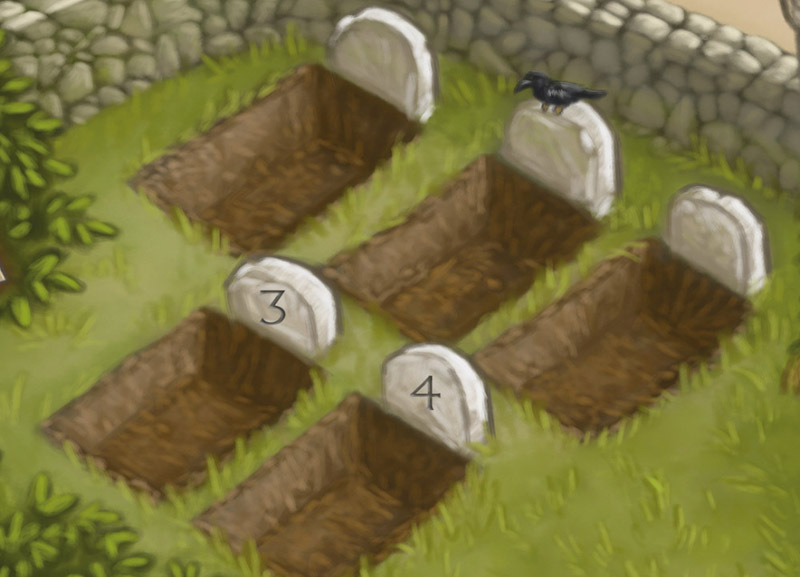 in a 2-player-game: put an unused family member on each space and grave labeled "3" or "4". Put the next starting player marker on its designated space of the council chamber. 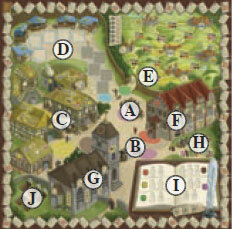 Place the goods tiles (horses, oxen, wagons, plows, and scrolls) next to the game board as a general supply. 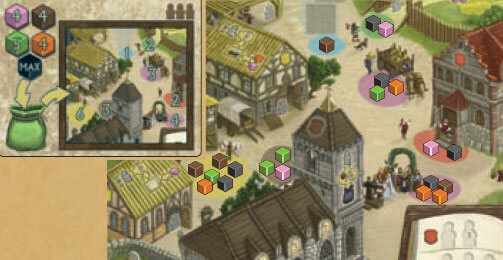 Place the bags of grain, the influence cubes, and the plague cubes next to the game board as a general supply. Also place the green bag nearby. Put the 4 black monks in the black bag and place it below the church. Take the setup card that matches the number of players and place it nearby. Return the remaining two setup cards to the box. Also place the "mass" overview card near the game board. The oldest player becomes the starting player and receives the starting player marker. You must gain the most prestige points and the game ends when either the village chronicle or the anonymous graves are fully occupied. At that point you once more gain points for the different areas of the village. The game is played over several rounds, during which you control the fate of your family members by placing them wisely in the village. Family members on your farmyard ensure a good harvest, in church they generate prestige points, and in the council chamber they give you both prestige points and privileges. Those who opt for traveling may receive prestige, influence, or money, depending on their destination. Family members in the craft buildings enable the production of goods. Goods and grain can be exchanged for prestige points at the market. The many different areas in the village allow for many different options. Each area has an associated action space where you can gain different types of influence cubes and trigger certain actions. In addition, many of these actions cost time. And just like in real life, the oldest family members eventually pass away. When a family member dies, his career choice determines whether he gets a place in the village chronicle or not. At the beginning of each round, seed the action spaces with influence cubes and plague cubes. Then, beginning with the starting player, players take turns carrying out actions. On your turn, take one cube from an action space and perform that space's action. When the last cube is taken, the current round is finished. Begin a new round by once again filling the green bag and seeding the action spaces. black The black cubes are not a type of influence. They are plague cubes that reduce the life span of your family members. The setup card shows how many different influence cubes you must take from the supply and add to the green bag at the beginning of a round. In addition, you must add all available plague cubes to the bag. Once the cubes are in the bag, mix them thoroughly. Then distribute a certain number of randomly drawn cubes onto each action space on the game board. The number of cubes per action space is also shown on the setup card. Note: If there are fewer influence cubes of one color available in the supply than the number you are supposed to add to the bag, then add only the available cubes. (Since some cubes remain in the bag each round, you will still be able to fully seed the action spaces). The starting player then takes his turn. On your turn, you must take one influence or plague cube from an action space of your choice. If it is an influence cube, put it on your farmyard. (You may store any number of influence cubes on your farmyard). If it is a plague cube, immediately return it to the supply and lose 2 time. This means you must move your life time track marker 2 spaces forward in clockwise direction. You may then perform the action of the action space from which you took the influence or plague cube. You are allowed to only take the cube and not carry out the action. Whenever you perform an action that costs time (every hourglass represents one unit of time), you must move your marker on your life time track forward (clockwise) the appropriate number of spaces. In addition, you lose 2 time whenever you take a plague cube. As soon as your marker passes the bridge, one of your oldest family members passes away. If you have one or more family members on your farmyard, then they may perform a harvest action. Immediately take 2 bags of grain from the supply and place them onto the appropriate spaces of your farmyard. If you do not have any family members on your farmyard, then you cannot perform this action. If you also own a horse and a plow, take 3 bags of grain instead. If you also own an ox and a plow, take 4 bags of grain instead. (You may never use more than one combination, i.e., several family members, plows, oxen, or horses are of no additional use during a harvest). Your goods are not used up during the harvest. So - for example - when using an ox and a plow with the harvest, you do not need to discard them. Your family members remain on your farmyard. Note: Each farmyard has a capacity of 5 bags of grain! You can never own more than 5 bags of grain at once. This action represents a new family member being born. Immediately take one family member of your color from the general supply and add it to your farmyard. You must always take the family member with the lowest available number from the supply. Example: Peter has one family member with the number "2", two with the number "3", and two with the number "4" left in the supply. He must take the "2" family member. Important: Instead of taking a new family member from the supply, you may use this action to instead return one of your employed family members (not yet deceased) from the game board to your farmyard. Note: Family members added to the game board during one of the following actions (or added to the black bag by means of the "church" action) must always come directly from your farmyard. If you want to pay for a good with time, you first need to train a family member in the appropriate craft building. Place a family member from your farmyard onto the craft building that you want to use. This costs you a certain amount of time (the number of hourglass symbols next to the image of the gray family member on the building's roof). You may then immediately produce the corresponding good by paying as much time as indicated by the production arrow on the building's roof. Your family member will remain on the same craft building for the rest of the game (unless he dies or returns to the farmyard by means of the "family" action). As long as he remains on the craft building, you may produce a good again by means of the "crafts" action. In doing so, you now only pay as much time as indicated in the production arrow (since your family member is already trained). Note: Family members may only produce the good of the craft buildings they are placed onto. (A blacksmith can only produce plows, not scrolls). There is no limit to how many family members, regardless of colors, may be on any building. (Exception: Players may not place family members onto the mill). 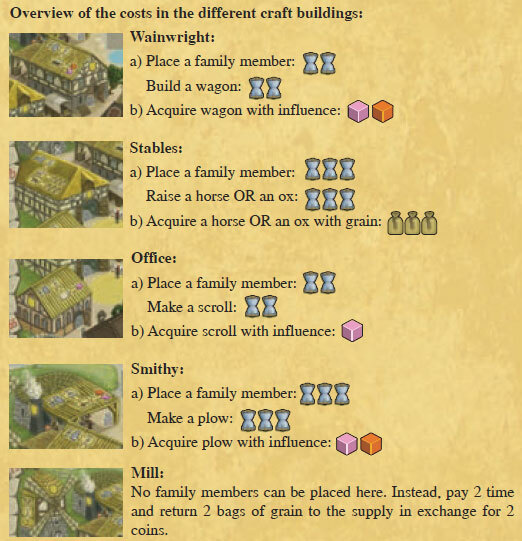 Regardless of whether you have a family member on a craft building or not, you may purchase the good that the building produces by returning the specified amount of influence cubes (or bags of grain in the stables) to the supply. You do not need to have a family member on the craft building. (In the example on the left, Philipp could have also acquired the wagon by returning 1 orange and 1 pink influence cube to the supply - without placing a family member and losing time). This action triggers a market day in which all players can participate. This action must be carried out. A market day must be held. If you triggered the action, then you are the first player allowed to serve one available customer. Available customers are all customers directly in front of the stalls on spaces with blue borders. (The customers on the remaining 5 spaces are in the waiting line and cannot be served). Each customer wants certain goods and/or bags of grain. To serve the customer, return the required goods and/or the required amount of grain to the supply, take the customer tile, and put it face down next to your farmyard. At the end of the game, this customer is worth however many prestige points are printed on it. Then - in clockwise direction - the remaining players take their turns. Each player may choose one of the remaining customers. However, in addition to delivering the required goods and bags of grain, the other players must also pay 1 green influence cube and 1 time. Players that do not want to or are unable to sell anything must pass and may not later re-enter the current market day. When it is your turn again, you may serve another of the remaining customers. This time, however, you must also pay 1 green influence cube and 1 time. (Only your first sale is free). The market day continues in clockwise direction until all customers have been served or all players have passed. The market day then ends. Depending on the number of players, fill up the blue bordered spaces with new customers. This is done by moving the waiting customers up in order. Then refill the waiting line with new customers from the pile. (If no customers were served, all customer tiles remain in place). Note: Should all customers be served at some point, then the market stalls remain empty for the rest of the game. This action allows you to send a family member out into the world. 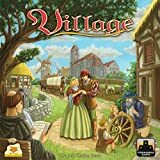 If you do not have any family members on the travel map of the game board, then take a family member from your farmyard and place him on one of the two neighboring cities that can be reached from the village. You must pay the cost of the trip, shown on the path. You will certainly have to pay 2 time and return 1 wagon to the supply. Additionally, depending on which way you go, you will also have to return either 2 brown or 2 pink influence cubes to the supply. Take one of your markers and place it onto the city traveled to. This gets you the reward shown in the circle (3 prestige points). move one of your family members that is already on a city to an adjacent city. Adjacent cities are all cities directly accessible via a path (without skipping over another city). You must again pay the cost of the trip and put a marker onto the city you reached. You then receive the city's reward (2 influence cubes of your choice from the supply, 1 coin, or 3 prestige points). Note: You can only place a marker and thus receive a city's reward once per city. Should your family member travel to a city where you already have a marker, then you may neither place another marker nor receive the reward. There is no limit to the number of family members and different colored markers allowed on any city. At the end of the game, you will receive prestige points depending on the total number of cities that your family visited during the game. c) If you already have at least one family member in the council chamber, then you may perform a privilege action without moving a family member. In this case, perform the privilege action shown below either its current or a previous stage for free. 1st stage: Take the next starting player marker from the council chamber. If the marker has already been taken by another player, you receive nothing. If you take the marker, then you will be the starting player in the next round. At the beginning of the next round, take the starting player marker and return the next starting player marker to its designated space in the council chamber. 2nd stage: Take 2 influence cubes of your choice from the supply. 3rd stage: Take 1 goods tile of your choice from the supply and put it next to your farmyard. 4th stage: Pay exactly 1 coin to the supply in exchange for 3 prestige points on the prestige track. There is no limit to the number of family members allowed on any stage. At the end of the game, each family member that has reached at least the 2nd stage in the council chamber is worth prestige points. You may add one family member from your farmyard to the black bag. For doing this, you must pay either 1 brown influence cube (returned to the supply) OR 3 time. Family members added to the black bag may be drawn and placed onto the church during a mass. A mass is said at the end of each round as well as at the end of the game. Instead of taking a cube from an action space, you may instead return 3 same-colored influence cubes to the supply (but not plague cubes). For this, you may carry out any one of the previously listed actions. Note: The well action is only possible as long as there is at least one cube left on any action space. By the way: This is the only way to perform an action when there is no cube left on the corresponding action space. When a player takes the last cube from the board (i.e., all action spaces are empty), he first carries out his action as usual. The current round is then finished and a mass is said. Thoroughly shuffle the family members and black monks in the black bag. Then draw exactly 4 pieces from the bag, either at random or deliberately by paying coins. Beginning with the starting player and then continuing in clockwise direction, each player may pick one or more of their family members from the bag by paying 1 coin per family member. (Since there are always 4 black monks in the bag, this is the only way to make sure that your family members are drawn). Once a total of 4 family members have been bought from the bag, no more pieces may be drawn. Should fewer than 4 family members have been bought from the bag, bring the total count up to 4 pieces by drawing the rest randomly. Once you have drawn 4 pieces, return all black monks to the bag. Place any family members drawn on the large rightmost glass window of the church. Family members that are still in the bag remain there and may be drawn during the next mass. 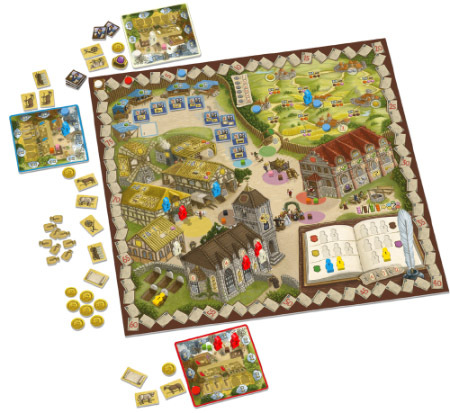 Once 4 pieces have been drawn from the bag (even if they were only black monks), each player may move one or even several of his family members up in the church hierarchy (move them leftward on the windows). Beginning with the starting player and then continuing in clockwise direction, each player may do this once. To move a family member to the next window on the left, you must return as many bags of grain to the supply as are shown between the windows. Your family members may even move up more than one window, provided you pay enough grain to cover all movement. At the end of the mass, the player who has the most family members in the church immediately gains 2 prestige points on the prestige track. In the case of a tie, the prestige points are awarded to the player whose family member is on the window the furthest to the left. If there is still a tie, then each of the tied players gains 2 prestige points. At the end of the game, each family member in the church is worth prestige points, depending on how far up it has moved. If a player has acquired the next starting player marker during the previous round, then he now takes the starting player marker and returns the next starting player marker to its designated space in the council chamber. Otherwise, the starting player remains the same. The new round starts again by filling the green bag with cubes and seeding the action spaces. To buy prestige points in the council chamber (final stage). To ensure your family members are chosen from the black bag during a mass. As a JOKER for any one influence cube. At the end of the game, each coin you did not spend is worth 1 prestige point. During the game, you must often pay for actions with time by moving the marker on your life time track forward in clockwise direction. Once you move the marker past the bridge, one of your oldest family members passes away. You first get to finish carrying out your chosen action in full and must only decide which of your oldest family members dies at the end of your turn. Exception: Anyone who moves his marker past the bridge during a market day must immediately choose which of his family members dies. Of your family members, it is always the one with the lowest number that has to die. If you have several family members with the lowest number, you can choose one of them. A dying family member must be visible at the time of his death. This means that he must be either on the game board or on your farmyard. (Family members still in the black bag cannot die, nor can ones that have not yet entered play). Example: Peter chooses the "crafts" action by taking a plague cube from the corresponding action space. He loses 2 time in doing so, moving his marker on the life time track past the bridge. Before one of his family members dies, he may still perform the "crafts" action. He places a "1" family member from his farmyard onto the smithy (which costs him 3 time) and produces a plow (which costs him yet another 3 time). Now that his action is over, his family member with the lowest number must die. He has two "1" family members on the game board and decides to choose to let the craftsman he just placed onto the smithy die. 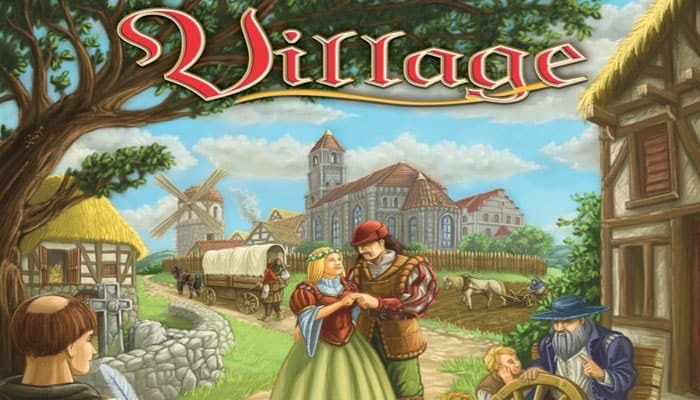 At the end of the game, you receive prestige points depending on how many of your family members were immortalized in the village chronicle. In this case, the family member is put onto one of the anonymous graves next to the church. Here he can rest in peace, but is not worth any prestige points. Note: Family members that have died should always be laid down so you can easily tell them apart from the still living, upright family members. Hint 1: It is an effective strategy to add family members to the village chronicle quickly. So don't be afraid of paying for actions with time. Hint 2: If you are putting a family member from your farmyard onto the game board, you should always consider the family member's number. "1" family members are likely to die during the game. 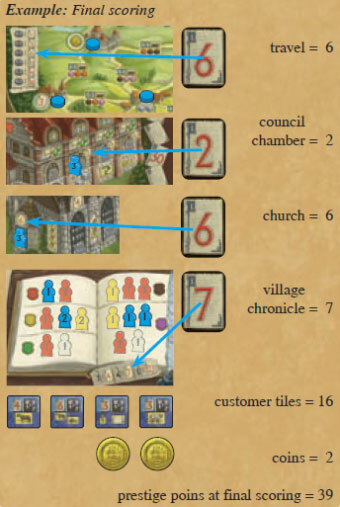 If you want to score in the church or council chamber at the end of the game, placing family members with higher numbers is usually the better choice. The player who put his family member onto the last empty space of the village chronicle or the last empty anonymous grave does not get another turn. All other players may perform one last action in clockwise player order. As always, you must either take an influence or plague cube from an action space or pay 3 same-colored influence cubes to perform the action. Should the final cube be taken from the game board (even though there are players left to act), the action spaces are not reseeded. Instead, the remaining players may perform any action without having to return 3 same-colored influence cubes to the supply. Note: In this case, the usual mass at the end of a round is skipped. The final mass is not said until all players have taken their final action. Note: If family members die during the final actions and there are no proper village chronicle spaces or graves left, then they are simply removed from the game. Special case: If the end of the game is triggered during a market day, finish the market day completely. Afterward, determine who has triggered the end of the game by occupying the last chronicle space or grave. If it is the same player who also triggered the market day, then he has taken his last turn and everyone else has one action left. If it was triggered by a different player, then all players, in clockwise player order, may carry out one more action. (The final turn of the game is then taken by the player who triggered the market day). After each player has taken his last action, the last mass is said. Final scoring then takes place. Each time you receive prestige points, score them by moving your marker forward on the prestige track. Whoever gained the most prestige points wins the game. In the case of a tie, the tied player who has served the most customers wins. If there is still a tie, the tied player with the higher number of "living" family members wins. Each family member on the 4th stage is worth 6 points. Each family member on the 3rd stage is worth 4 points. Each family member on the 2nd stage is worth 2 points. On the 1st stage, there are no points awarded. Each family member on the rightmost window is worth 2 points. Each family member on the second window is worth 3 points. Each family member on the third window is worth 4 points. Each family member on the leftmost window is worth 6 points. Family members in the black bag are not worth any points. You gain prestige points depending on how many of your family members are immortalized in the village chronicle. 1 or 2 are worth no points. 3 family members are worth 4 prestige points. 4 family members are worth 7 points. 5 or more family members are worth 12 points. At the end of the game, each player reveals their concealed customer tiles and receives the prestige points printed on them. Each coin is worth 1 prestige point.